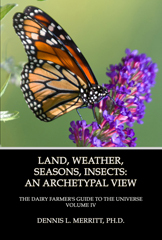 Land, Weather, Seasons, Insects explores the environment, with the Midwest as an example, using traditional Jungian and Hillmanian approaches to deepen our connection with the land, the seasons, and insects. Front Cover: A Monarch butterfly on Buddleia in Olbrich Gardens, Madison, Wisconsin. This “King of the Butterflies” is probably the best known of the North American butterflies and is the chosen image for the Entomological Society of America. The caterpillar feeds on the lowly milkweed, genius Asclepias, named after the Greek god of healing. The plant and the insect are toxic to most organisms. The insect is known for its uniquely long and complicated migrations. Photo by Chuck Heikkinen.